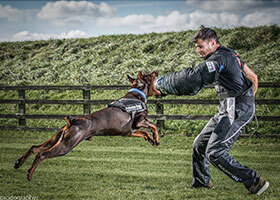 Protection Dogs Worldwide is proud to offer clients courses on protection training for their own dogs. 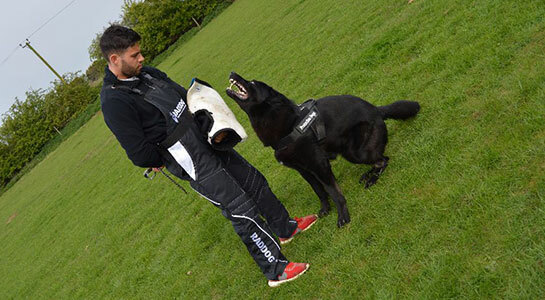 However, before training commences, it is important that your dog is carefully assessed for temperament and drive, in order to determine whether it has the necessary attributes to become a trained personal protection dog. Experience has shown that not every dog is capable of becoming a protection dog. This may be a shame in some cases and it is hard to disappoint expectant clients, but pushing an unsuitable dog into our training would be unfair on the dog, on us, and most of all on the client. 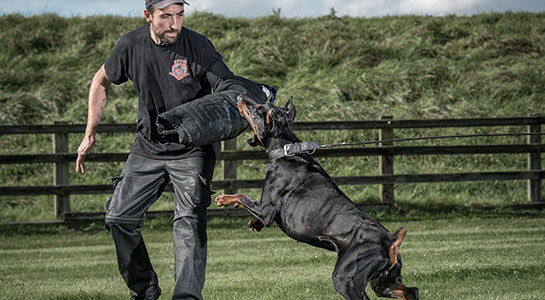 Attempting to take an unsuitable dog through protection training could even be dangerous, and Protection Dogs Worldwide refuses to take chances, and gamble with clients’ safety when the stakes are so high. 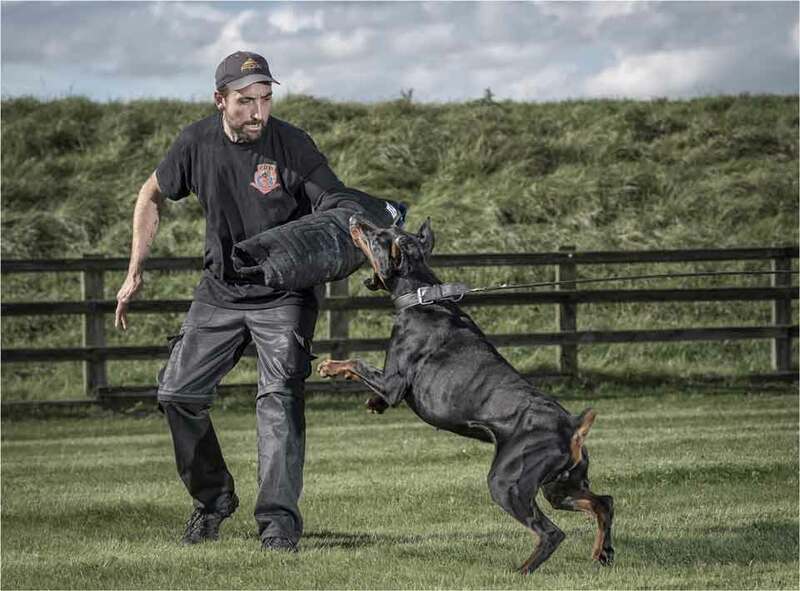 Protection Dogs Worldwide also strongly believes that proper protection training should only be undertaken by dogs which have sufficiently matured. 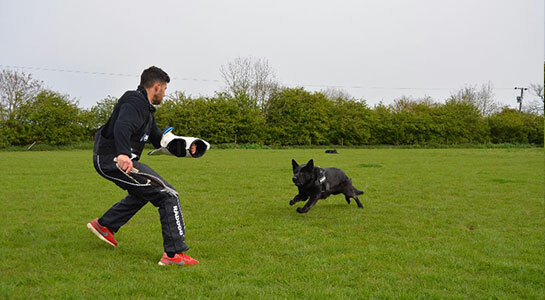 Attempting to take a puppy, or immature dog through a course of protection training can have a detrimental impact on its development, which we refuse to allow. Protection Dogs Worldwide is committed to allowing dogs to be dogs, and our entire team has enormous respect for every dog that we work with. We refuse to harm the development of puppies and young dogs by subjecting them to full protection training prematurely. It is therefore vital that your dog undergoes a careful and considered assessment before we commit to training it. 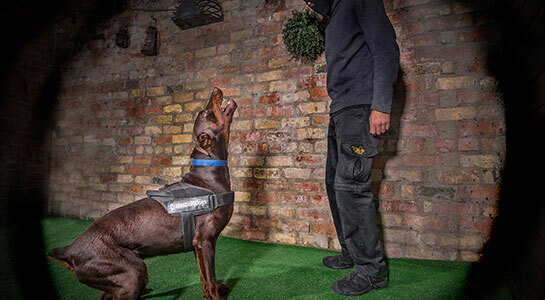 If it is capable of becoming a fully trained protection dog, we will provide you with an estimate of the time and cost required, and you can be confident that it will succeed under our training, guidance and care. 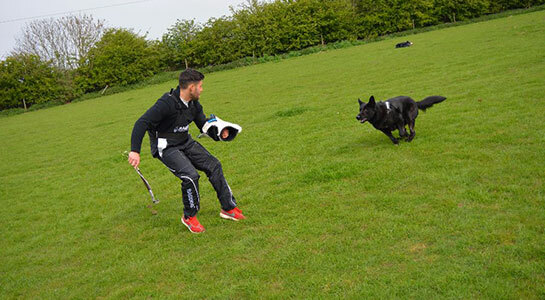 If we assess that your dog is not suitable for protection training, we will inform you immediately, as we have no interest in wasting your time or money. 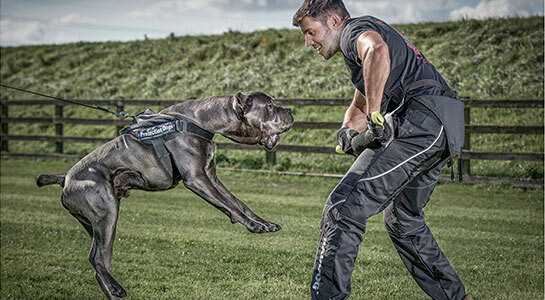 Before beginning protection training, each dog must first undertake essential obedience training. 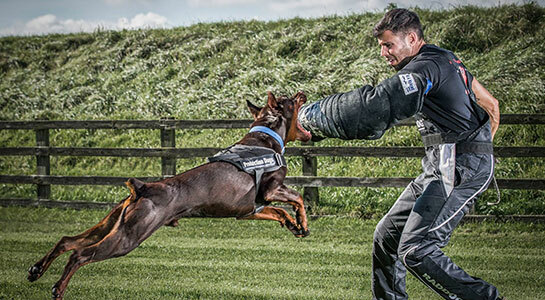 When thinking about the trust and competence involved in protection training, it is clear that dogs must be highly obedient at the outset, and this is one of the most important parts of the protection training process.If you think your dog has the potential to become a family protection dog, call us today to find out how we can help. If you think your dog has the potential to become a family protection dog, call us today to find out how we can help. 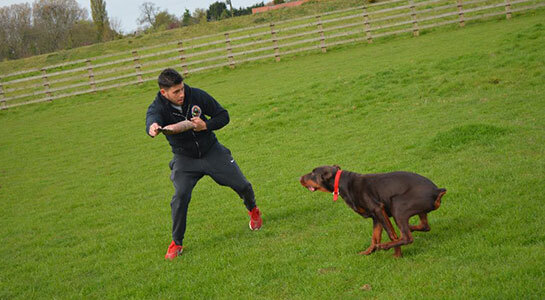 Before starting any protection training, your dog must have passed our obedience course.Protection training starts by utilising the dog’s natural prey instinct.During this phase we keep the training fun, engaging the dog in a game of tug. This enables him to become accustomed to the baiter, and any training equipment. 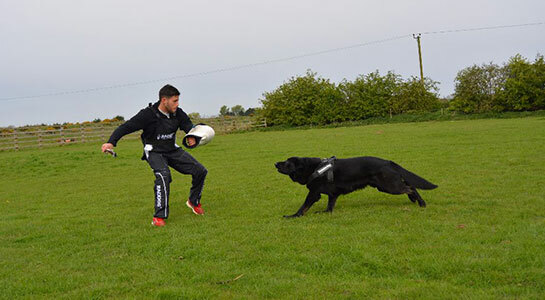 Limited control is used at this stage, as our main aim is for the dog to enjoy the engagement with the helper and build self-confidence. It is important that the dog feels Unpressured. This stage is crucial for setting the correct foundations that subsequent training is built upon. More structure and control is introduced at the second stage. By building on what the dog has already learned, we start to put behaviour on cue. This includes a reliable ‘out’ response (release of sleeve dogs are trained to bite). 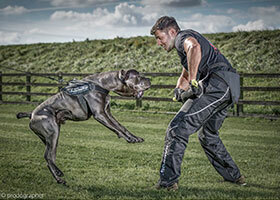 Training is progressed at the dog’s pace, utilising the skill and knowledge of the trainers. All the elements in Stages 1 and 2 are brought together here. If appropriate, real life threats and situations are introduced to the training. 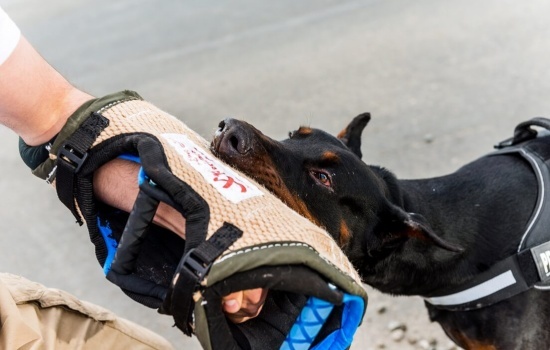 The dog will be tested for noise aversion and trained to focus on the human baiter as a training aid rather than an inanimate sleeve or bite pillow.